265 Beacon is located on the south side of Beacon, between Dartmouth and Exeter, with 263 Beacon to the east and 267 Beacon to the west. 265 Beacon was built ca. 1871, one of four contiguous houses (263-265-267-269 Beacon) designed as a symmetrical composition, with 263 and 269 Beacon having two-story oriels, defined mansards, and slightly projecting facades, and 265-267 Beacon having one-story oriels. Click here for an index to the deeds for 265 Beacon. In his Houses of Boston’s Back Bay, Bainbridge Bunting indicates that 263-265-267-269 Beacon were built by building contractor George Wheatland, Jr., four of more than 140 houses which Bunting indicates George Wheatland, Jr., built in the Back Bay and Bay State Road neighborhoods between 1867 and 1907. George Wheatland, Jr., usually held an ownership interest in the land where he built houses. In this case, however, he did not, and it appears he built the houses under contract to Eben D. Jordan. By 1872, George Wheatland, Jr., and his wife, Florence Saumarez (Dumaresq) Wheatland, had leased 265 Beacon from Eben D. Jordan. They previously had lived at 279 Clarendon. Florence Wheatland’s brother, Herbert Dumaresq, lived with them. He was a salesman with Wright, Bliss, & Fabyan, dealers in domestic goods. He previously had lived at 17 Beacon. Herbert Dumaresq married in June of 1873 to Eben D. Jordan’s daughter, Julia Maria Jordan. 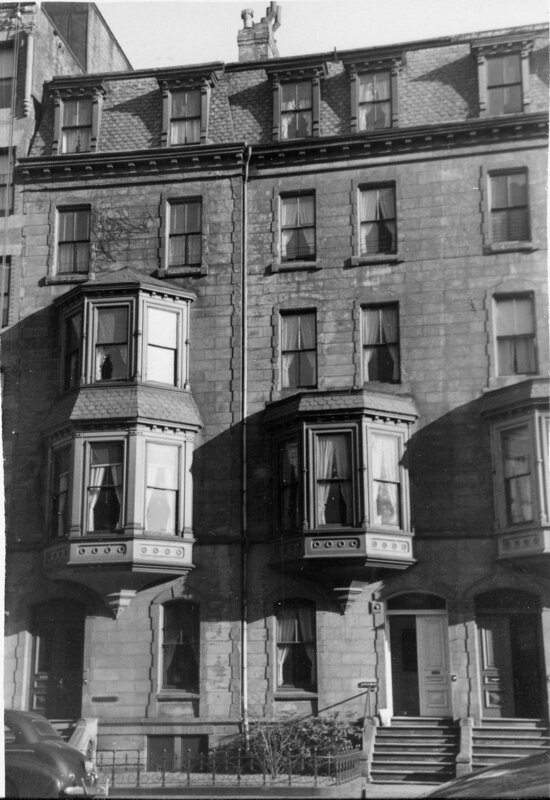 After their marriage, lived at 51 Chestnut and then at 166 Marlborough. The Wheatlands continued to live at 265 Beacon during the 1883-1884 winter season, but moved thereafter to a new home they had built at 235 Commonwealth. 265 Beacon was not listed in the 1885 and 1886 Blue Books. On June 1, 1886, 265 Beacon was purchased from Eben D. Jordan by banker and merchant Charles Whitney. He and his wife, Jessie Grant (Perkins) Whitney, lived at 336 Beacon and then at the Hotel Oxford (southeast corner of Exeter and Huntington). During the 1886-1887 winter season, 265 Beacon was the home of Edward Reynolds Andrews and his wife, Sarah Hannah (Addoms) Andrews. He was manager for eastern New England for the Equitable Life Insurance Company. He previously had been a banker in Paris, after which he had returned to New York and Boston to found a company, Andrews & Co., which introduced improved methods of creosoting timber. 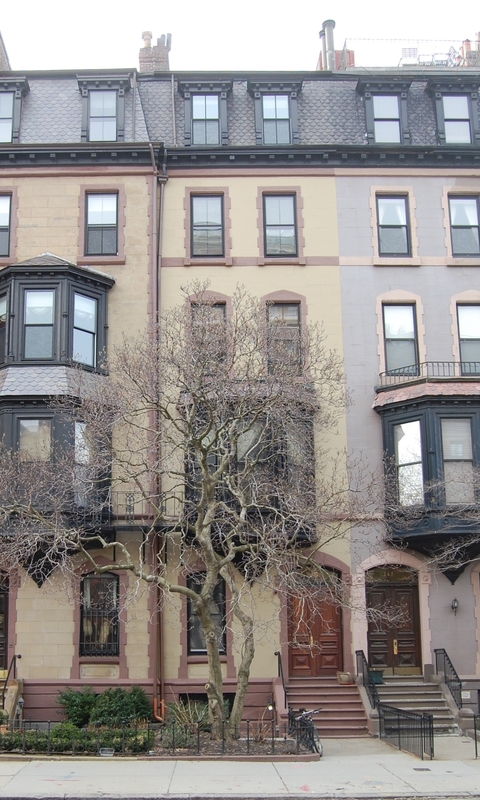 By the 1887-1888 season, the Andrewses had moved to 119 Beacon and 265 Beacon had become the Whitneys’ home. The Whitneys traveled abroad during the 1888-1889 winter season, and 265 Beacon was the home of attorney Francis Inman Amory and his wife, Grace Josephine (Minot) Amory. They previously had lived at 116 Beacon. By the 1889-1890 season, the Amorys had moved to 82 Marlborough. The Whitneys were living at 265 Beacon during the 1889-1890 winter season, but moved thereafter to the Hotel Huntingotn (Huntington at Blagden). During the 1890-1891 winter season, 265 Beacon was the home of Mr. and Mrs. C. E. Read. During the 1891-1892 winter season, it was the home of Henry Russell Shaw, a banker and broker, and his wife, Grace (Rathbone) Shaw. They had returned to Boston in August of 1891 after spending several years in Europe. By 1893, they had moved to 133 Commonwealth. 265 Beacon was not listed in the 1893 Blue Book. Charles Whitney died in January of 1893 in Milton. On March 30, 1893, 265 Beacon was purchased from Charles Whitney’s estate by attorney William Payne Blake and his sister, Anne Dehon Blake, an artist. They previously had lived at 21 West Cedar. Living with them in 1893 were Samuel Hoar and his wife, Helen Putnam (Wadleigh) Hoar. He was an attorney and general counsel of the Boston & Albany Railroad. Their primary residence was in Concord. In 1892, they had lived at 381 Commonwealth, and by 1894, they had moved to 250 Commonwealth. William Blake and Anne Blake continued to live at 265 Beacon until about 1909, when they moved to 338 Beacon. On August 3, 1909, 265 Beacon was acquired from William Blake and Anne Blake by attorney Alexander Lincoln. He and his wife, Eleanor Amelia (Ames) Lincoln, made it their home. They had married in June of 1909, and 265 Beacon probably was their first home together. They also maintained a home in Nahant. They continued to live at 265 Beacon until about 1930, when they moved to Brookline. 265 Beacon was not listed in the 1931 Blue Book. On February 9, 1931, 265 Beacon was acquired from Alexander Lincoln by Zlata Llamas Coomarswamy (Luisa Runstein Coomaraswamy), the wife of Dr. Ananda Kentish Coomaraswamy. They had married in November of 1930. Ananda Coomaraswamy was a noted philosopher and historian of Indian Art who served as curator of the Indian art collection at the Museum of Fine Arts from 1917 until his death in 1947. Luisa Runstein was a portrait photographer who worked under the name Zlata Llamas Coomarswamy. They continued to live at 265 Beacon until about 1936, when they moved to Newton. On December 21, 1936, the Massachusetts Hospital Life Insurance Company foreclosed on its mortgage to Alexander Lincoln, which had been assumed by the Coomarswamys, and took possession of 265 Beacon. On January 12, 1937, 265 Beacon was acquired from Massachusetts Hospital Life Insurance by Dr. Clark Otto Doubleday, a dentist, and his wife, Mary (Rourke) Doubleday. They previously had lived at The Graffam at 330 Dartmouth. In January of 1937, he filed for (and subsequently received) permission to remodel the house (including removing a rear bay window on the first floor) and convert it from a single-family dwelling into a single-family dwelling and doctor’s office. Mary Doubleday died in October of 1944. Clark Doubleday continued to live and maintain his office at 265 Beacon until the late 1940s, but by 1950, had moved his residence to Wellesley Hills. He continued to maintain his offices at 265 Beacon until about 1960. On November 8, 1957, 265 Beacon was acquired from Clark Doubleday by Frederick J. Dubrava, Jr. 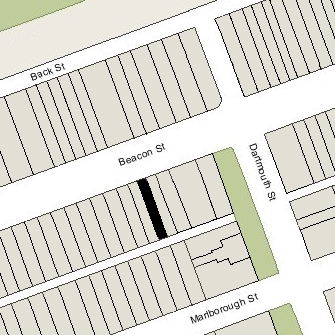 The property subsequently changed hands and by 1961 appears to have been converted into several apartments (the Boston City Directory cross index lists three people at 265 Beacon, each with their own telephone number). On March 4, 1963, 265 Beacon was acquired by John V. Kunigenas. In April of 1963, he filed for (and subsequently received) permission to remove portions of the interior in preparation for remodeling to be undertaken under a separate permit, already filed. That permit is not in the Building Department records. It appears likely that this remodeling increased the number of units to eight, inasmuch as that is the number on file with the Assessing Department as of 1964. On June 29, 1973, 265 Beacon was acquired from John V. Kunigenas by Anthony P. Baker, general partner, Bay Associates Limited Partnership II. On July 7, 1973, John Kunigenas foreclosed on the mortgage given by Anthony Baker and took back possession of the property. On December 1, 1978, 265 Beacon was purchased from John Kunigenas by the 265 Beacon Realty Corp. (Paul G. Roiff, president). In February of 1979, it filed for (and subsequently received) permission to legalize the occupancy as eight units. 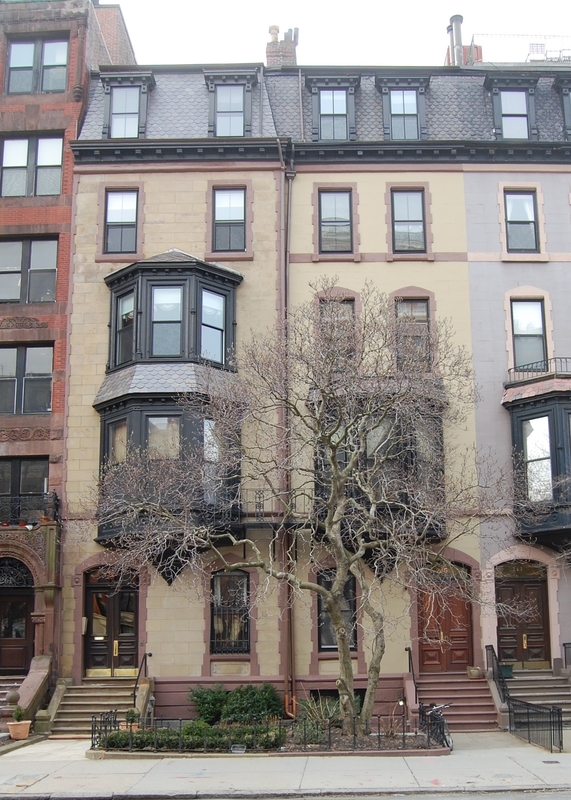 On May 21, 1979, it converted the property into eight condominium units, the 265 Beacon Street Condominium.